In 2011, paleontologists reconstructed the body profile of two extinct giant penguin species, Kairuku grebneffi and Kairuku waitaki, which belong to the Sphenisciformes order of penguins. Three skeletons collected from late Oligocene Kokoamu greensand of New Zealand are among the most complete Paleogene penguins known [Ksepka, Fordyce et al, 2012]. Kairuku specimens were first recovered by paleontologist Brian Marples in the 1940s, but were not well preserved and were incomplete. The first complete find involved 27-million-year-old fossilised bones in a cliff alongside the Waihao River near Waimate in South Canterbury, halfway between Timaru and Omaru, in 1977 by Ewan Fordyce, a paleontologist from the University of Otago. More specimens were found during the next 35 years, with the most recent in 2011. An array of partial associated skeletons from the Eocene-Oligocene of New Zealand historically referred to as Palaeeudyptes antarcticus or Palaeeudyptes sp. are recognized as at least five distinct species: Palaeeudyptes antarcticus, Palaeeudyptes marplesi, Kairuku waitaki, Kairuku grebneffi, and an unnamed Burnside Formation species [Ksepka, Fordyce et al, 2012]. 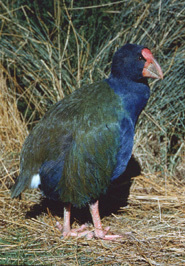 Kairuku grebneffi is different from K. waitaki primarily because of vertebrae spacing, and a straight tipped beak compared to a curved tip of K. waitaki. The two species co-existed at the same time. Prehistoric Kairuku penguin are only known from New Zealand. They stood about 130 cm (51 inches) tall, had a stretched length of 150 cm, and weighed at least 60 kilograms. Kairuku were 30 cm taller, and 50 percent heavier than the Emperor penguin Aptenodytes forsteri, the tallest and heaviest living penguin species of today. Emperors are 122 cm (48 inches) tall and weigh between 22 and 45 kilograms. Another giant fossil penguin, the water king penguin Inkayacu paracasensis discouvered in Peru in 2007, had a swimming length of 150 cm (59 inches), and is believed to have lived 36 million years ago. Fossilised feathers show that the water king was reddish brown and gray coloured. Paleontologists are cautious in naming the largest fossil penguin, especially when there is a challenge of extrapolating body size from a few bones. Kairuku grebneffi is a contender for largest penguin with Anthropornis nordenskjoeldi and Pachydyptes ponderosus. The humerus or upper wing bone of Kairuku is the longest that has ever been recorded, and longer than that of Pachydyptes, which had a heavier and stockier body. Kairuku was an elegant, tall and slender bird, with an elongated spear-like beak, long flippers, and thick legs and feet. 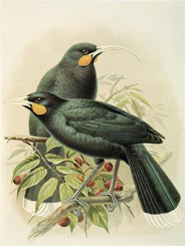 It was the largest of the five species common to the area in that time period, and probably became extinct from its New Zealand habitat between 24 and 25 million years ago. New details of key elements of the stem penguin skeleton associated with underwater flight, including the sternum, flipper, and pygostyle were revealed by the 2011 reconstruction. Relative proportions of the trunk, flippers, and hind limbs were determined, providing a better insight into the body of stem penguins, and better constraints on size estimates for ‘giant’ taxa. Kairuku have an elongate, narrow sternum; a short, flared shoulder projection attaching the bicep (coracoid), an elongate narrow flipper, and a robust hind limb. The pygostyle lacks the derived triangular cross-section seen in extant penguins, suggesting that the rectrices attached in a more typical avian pattern, and the tail may have lacked the propping function of living penguins. More than 20 penguin species are known from New Zealand and the oldest is more than 60 million years old [Campbell & Hutching 2007]. Ksepka DT, Fordyce RE, Ando T, Jones CM, et al. New fossil penguins (Aves, Sphenisciformes) from the Oligocene of New Zealand reveal the skeletal plan of stem penguins, Journal of Vertebrate Paleontology, 27 February 2012. Campbell H., Hutching G., In search of ancient New Zealand, Institute of Geological and Nuclear Sciences Limited, Penguin Group Ltd, 2007. When Kairuku penguins lived more than 24 million years ago, the predecessor of the New Zealand of today, Zealandia, was mostly beneath water, sunken on the ocean floor. Differing geological arguments claim total immersion of all land, or islands from higher elevations above sea level. The case for complete submergence cannot be geologically proven, nor can the case for continous land. However, there is biological argument for partial immersion from the survival and emergence of Gondwana species, the tuatara reptile, leiopelmatid frogs, the araucarian ancestor of the kauri tree, and beech and podocarp trees. The ancestors of modern species, that were known to originally occupy Gondwana 80 million years ago, before Zealandia broke away, must have survived in isolation somewhere other than the Gondwanan Australian or Antarctic land masses. The coastal Herangi Range in the Waitomo District, Southern Waikato has been of interest to geologists attempting to define the extent of land in New Zealand during Late Oligocene to Early Miocene time. The Herangi Range reaches a peak elevation of 803 metres. The lower western face is one of only two habitats in the world of Archey's frog Leiopelma archeyi, a living fossil that is the most primitive frog in the world, endemic to New Zealand, and very similar to frogs in fossils found in Queensland, Australia from the late Jurassic 150 million years ago. The only bit of what is now the North Island that was upstanding enough and that may have been an island 23 million years ago is the Herangi Range ... there may have also been small islands north of Northland in what is now the Norfolk Basin [Campbell & Hutching 2007]. Evidence for these islands is based on the existence of remnant flat surfaces, presumably wave-cut, at considerable depths, in excess of 1000 metres. Dredging of these surfaces has recovered fossils of shallow-water organisms. So, it is most likely that these areas were once at or above sea level and have subsequently sunk [Campbell & Hutching 2007]. 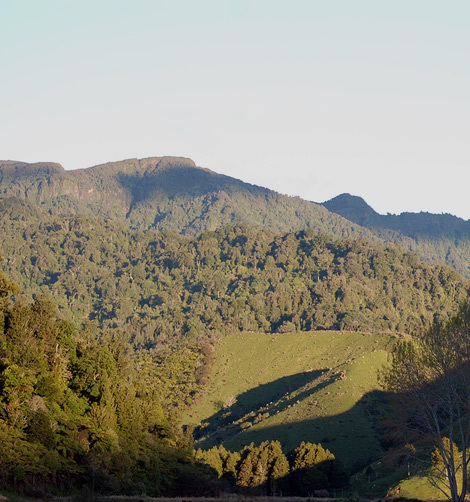 Photo below: The west face of the Herangi Range viewed looking southeast from Moeatoa. The high point is 803 metres. Copyright © 2009 Graeme Woodhouse. 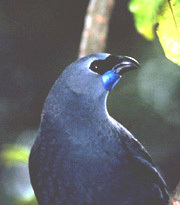 Above: The extinct giant penguin Kairuku grebneffi. Images Chris Gaskin, Copyright © Geology Museum, University of Otago. Used with permission. Archey's frog is a freshwater species now found in damp forest conditions, and no longer found around large bodies of freshwater. As it is intolerant of salt water, it is unlikely to have swum or rafted to Zealandia, after the remnants of the submerged continent started uplifting from the ocean in the late Oligocene 23 million years ago. The partial submersion theory for Zealandia is supported by the possible uninterrupted habitation of Archey's frog in the Herangi Range throughout the Oligocene-Miocene. With so much of Zealandia under water in the Oligocene/Miocene, Kairuku penguin would have had a rich food supply. A limestone layer tens of metres thick formed in a shallow sea from remains of bryozoans, corals, brachiopods, molluscs, barnacles, echinoderms, whales, penguins, fish and turtles in an abundant sea teeming with life. Limestone is a biogenic sediment - that is, of biological origin ... sediment that makes up limestone is entirely comprised of the skeletal remains of shelly organisms. It is wall-to-wall fossil! The Late Oligocene to Early Miocene limestone of Zealandia is no exception [Campbell & Hutching 2007]. Penguin spend half of their time feeding at sea, and are otherwise ashore to roost, breed and nest. Fossil penguin discovery discounts the total land emersion argument. Possibly a Herangi Range island provided a suitable breeding habitat for Kairuku penguin during the late Oligocene. In 2007, a near-complete fossil skeleton of a large penguin was found at Kawhia Harbour, which is north of the Herangi Range. And the fossil penguins of South Canterbury suggest there was other land above sea level supporting penguin colonies. Discovery of a juvenile Kairuku leg bone at Waimate indicates that Zealandia was not totally immersed. Juvenile penguin remain high and dry on land until they are sufficiently mature to go to sea to feed themselves. Zealandia was at maximum submersion at the end of the Oligocene 24 million years ago, and by the early Miocene 15 mya the new New Zealand was being vigorously uplifted by tectonic activity. The juvenile Kairuku bone deposited on the seafloor, was fossilised before the seabed uplifted to become land. Copyright © 2011-16 TerraNature Trust. All rights reserved.